The subelement focus feature and subelement progress charting has been added back to the U.S. ham radio practice exams at http://copaseticflows.appspot.com/hamtest. Now, in addition to tracking your practice test scores over time, you can also scroll down the scores tab to see your scores broken out per subelement. Each subelement score graph has a button directly below it that will setup a practice test of only questions from that subelement. 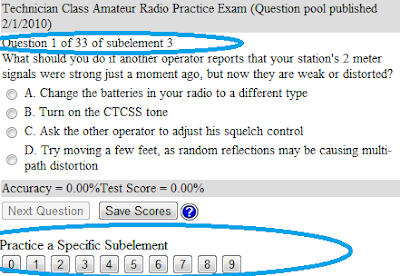 You can also start a test for a particular subelement on the 'Test' tab by clicking one of the subelement buttons below the question and answer area.